What to Make of the Menu Board Industry? You know that thing called the Internet? Well, it isn’t a fad and it’s not going away. In fact, some studies have shown that 27% of the world’s consumers do their shopping online with that number creeping to 55% during the holiday season. It increases even more when you consider those who do competitive “browsing” online only to make a more traditional face-to-face or telephone transaction. So why do I bring this up? How does this relate to menu boards, drive-thrus and digital signage? Quite simply it’s because people are using this avenue to learn, research and buy these types of products just as they would an airplane ticket, a pair of shoes, or a knife set. Yet, when you compare one menu board company to another, to another, to another, you begin to see that there is not a lot of differentiation between them. They have similar products at similar price points. Taken a step further, you’ll notice that what you see with the newer concepts and at more modern food courts (for example) doesn’t coincide with what people find or see online in regards to menu board systems. Why is that? Are companies like us, who do a lot of custom work, missing the mark? Has there been a shift in the menu board industry? Knowing that people are looking for and going with something different, why hasn’t a company risen and taken the lead in this market? Let’s take a look at traditional menu boards, drive-thrus, and digital signage and see if we can sort this out. 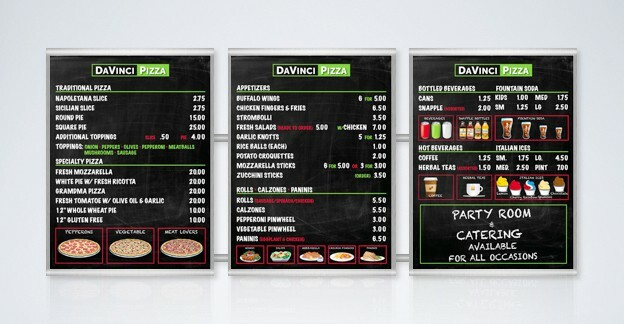 Traditional menu boards come down to two options: (1) illuminated or (2) non-illuminated. The one certainty that has been established is that the popularity of the backlit track systems with florescent bulbs has come to a screeching halt. With the price of LED lighting becoming increasingly competitive and its ability to provide greater longevity and a slimmer profile within a panel are the main reasons for the demise. Add the fact that more and more people see less of a need for strip-and-digit set-ups. Going this route inhibits design flexibility and lessens the overall look of the menu board. On the non-illuminated side is where we see the greatest discrepancy from solution to solution. One can assume that the reason for this is because, in general, people are seeking uniqueness for their locations. This goes for the mom-and-pops as well as the chains. In either scenario they would like to be definitively different from their neighbor down the road. The argument could be made that the difference lies within the designs of the graphics; however a stainless steel menu board system is still a stainless steel menu board system. From a consumer point of view, you never want to feel forced in to a purchase because that is all that is offered. This is why you are seeing more custom work being done. Companies are willing to pay a premium to have fixtures manufactured that will work with their interior design. On the flip side, the likes of Red Mango, Chipotle and Panera Bread have gone with straightforward, inexpensive solutions that are easy and cheap to upkeep. The main thing to point out in these instances is that they do not appear budget-based solutions. These exist and are easy to come up with, but it is on the menu board companies to let-it-be-known when these consumers are floating about the Internet. Drive-thru menu boards are a little bit more straight-forward. There are not many tickets in town when it comes to purchasing them. However, there are sign companies that see no problem with putting a light box on a stick and proclaiming it a drive-thru – it’s not. If you consider what you have seen over the last 20 years, not a lot has changed. This is rather peculiar given the world we live in. In fairness, LED lighting has been added to most, some have attempted a different look or style with limited success and digital drive-thrus continue their attempt at a breakthrough (call us if you want to know why this is a bad idea). Yet as you look at the different drive-thrus from location to location, there is very little that distinguishes one from another. Sure, there are those with toppers and wings, those that swivel for day parts, some that are wall-mounts, those that differ in look (i.e. Starbucks) but at the end of the day, it is but a light box or series of light boxes / cabinets with a combination of graphics and strips usually mounted on the ground. The old adage “if it isn’t broke, don’t fix it” seems to resonate here. Again, other approaches have been made but the reason not much has changed is because it works! Although we have most definitely seen significant growth with digital for menu boards, there still hasn’t been that surge that many have predicted the last couple of years. In my opinion there are four reasons for this: (1) The cost is still an issue. It has decreased substantially but you can’t do anything about the fixed cost of a commercial grade monitor; (2) It simply doesn’t fit the look folks are going for; (3) Companies have found flexible/inexpensive ways to upkeep traditional menu boards; and (4) There are an overwhelming amount of options to choose from. With so many options comes the trepidation and a lack of conviction on whether you are making the right choice. And with the price-point being greater than that of a static system it makes it a more difficult leap of faith to make. We’d love to hear your thoughts. Give us a call today at 888-235-2579, email us at info@origindisplays.com or contact us here!